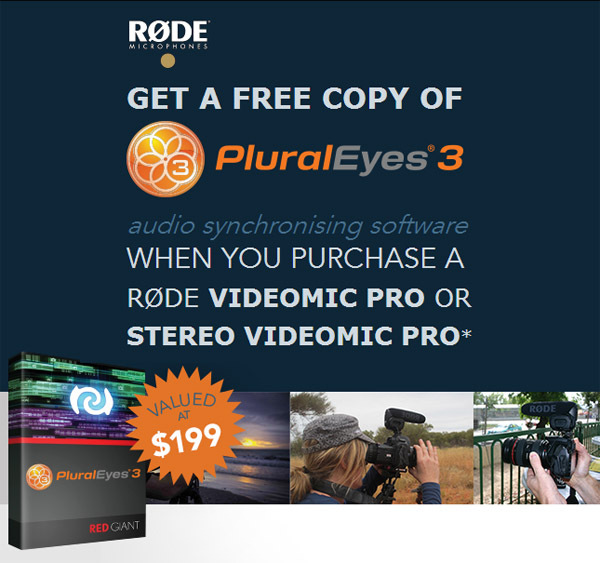 RØDE and Red Giant are teaming up to bring you a FREE copy of Plural Eyes 3 software to anyone who purchases a VideoMic Pro or Stereo VideoMic Pro in November and December 2012. Great news for videographers and editors this month! RØDE and Red Giant are teaming up to bring you a pretty sweet deal - during November and December this year, we’re giving away a FREE copy of Plural Eyes 3 software to anyone who purchases a VideoMic Pro or Stereo VideoMic Pro. Videographers, filmmakers, cinematographers and directors will find an audio solution to suit any need in RØDE’s broadcast range of mics, whether you’re shooting on DSLR, camcorder or a RED Epic. Once you’ve captured amazing audio however, you’ll need some equally amazing software to complete your project. Save yourself hours in post-production work with Plural Eyes 3, software designed for multi-camera edits, dual-system audio or multi-take workflows such as music videos. It automatically synchronizes all your audio and video clips without the need for timecode, clappers or any special preparation, leaving you more time to focus on your creative editing and storytelling. With support across Final Cut Pro®, Media Composer®, Premiere Pro®, and Vegas Pro®, this is a must-have tool for filmmakers of any level. Posted by Jack Walker on 11/1/2012 8:26:00 PM Ad is misleading since it does not say that PluralEyes 3 is MAC ONLY. For PC there is only PluralEyes2. I know because I received an ad for PL3--and I purchased it--only to find when I went to download that I could only get PL2 to download. I already owned PL2, so wasted my money. After contacting Red Giant I was emailed back that PL3 for the PC MIGHT come out sometime the beginning part of 2013. Replied by LA Color Pros Hi Jack, PluralEyes 3 for PC is in the making. I'm sure they will have a free upgrade path for you to obtain PE3 once it is released. On the Red Giant Website, if you buy Plural Eyes 3, you get to download Plural Eyes 2 for PC and then you get the free upgrade when PL3 comes out. Replied by LA Color Pros Jamie, thank you for the clarification. since I purchased a videomic pro just a few weeks ago. Replied by LA Color Pros That's great Bernard. You can register at rodemic.com for your new VideoMic Pro for 10 years RODE warranty too.